Have I got a story for you. 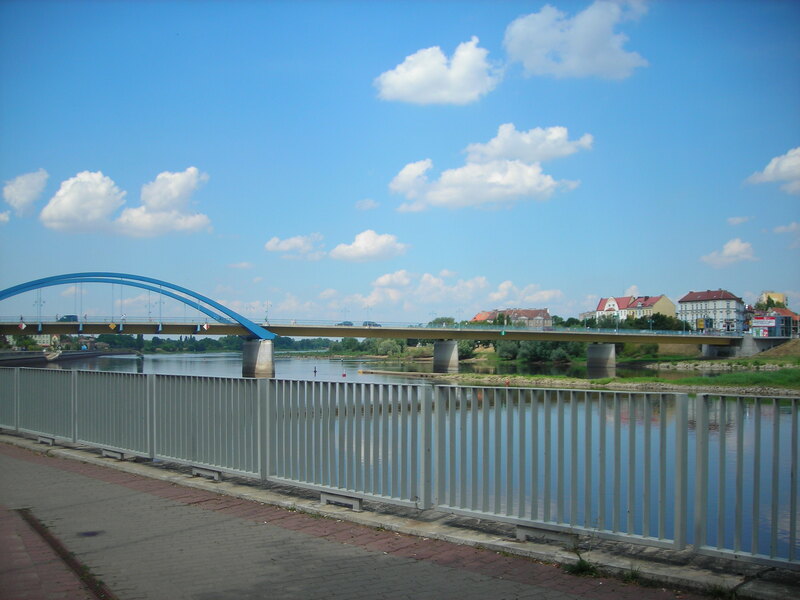 Earlier this month I paid a visit to two cities on the German/Polish border: Frankfurt on der Oder [German] and Slubice [Polish], separated by the River Oder. They used to be two sides of one German city, but Poland ended up with everything east of the river after WWII. The people who live in these cities don’t have much personal history there: Frankfurt was evacuated during WWII and very few of the residents ever returned; meanwhile Poles were brought in from elsewhere to resettle Slubice when it became Polish territory. There is one bridge across the river between the two cities (see above). From the end of WWII until 2007 it was at times a controlled border crossing and at other times closed completely. But now that Poland has joined the European Union’s border-free Schengen Zone, anyone can walk over the bridge without so much as a Simon says. The result: people who spent many years having nothing to do with one another (save perhaps a black market cigarette sale) are suddenly close neighbors. And although the two cities are starting to connect in small ways, traveling across the bridge is rarely a part of daily life. You can’t take public transportation from one to the other, for example.